I know what your thinking. Stuffed Manicotti is not an easy dish! Precooking the pasta, then trying to fill them without ripping the cooked noodles, forget about it! But I had an "A-ha" moment a while back, while I was making lasagna. If you are like me then you have never precooked lasagna noodles, and you don't have to pre-boil your manicotti shells either! You can stuff your manicotti shells before they are cooked and freeze them in a pan or bag of sauce, just like you would lasagna. Then just pull them out and bake. The pasta will cook while they bake! Here's a recipe to get you started. It makes one 9 x 13 inch pan, so I usually double it and make one for dinner and freeze the other for later. ( I use an extra deep 9 x 13 roasting pan so the sauce/cheese don't spill over the top! Don't have a large freezer to store a 9 x 13 pan? No worries, at the end, you'll find freezing instructions for small space freezers! Combine ingredients for the meat sauce and let it cool. In a mixing bowl, combine all ingredients for cheese filling. Using an empty wax paper cereal liner bag, put filling in the bag (may need to put in only 1/2 at a time if it's a small bag). Twist the top of bag closed and snip off a corner of the bottom of the bag so you can squeeze the filling into the tubes. The cereal bags are great, because the filling doesn't stick to the wax paper bag and just squeezes right on out into the pasta tubes, easy peazy! Fill the dry uncooked shells and lay them on a cookie sheet as you work. To package the manicotti in a 9 x 13 pan for baking right away or freezing: Spread a 1/2 cup of the meat sauce into the bottom of the pan, then lay the shells in a single layer in the pan. Pour remaining sauce over the shells. Top with cheddar cheese. Wrap in foil and freeze. Small space freezer: Package Manicotti in a freezer bag: Lay manicotti in a freezer bag. Pour sauce over the top. Seal bag well. (may want to double bag) then lay bag on a cookie sheet and make sure the shells are all in a single layer in the bag. Label bag. Place cookie sheet in the freezer to flash freeze the bag. Once the bag is frozen, you can remove the cookie sheet and stack the bags on their sides agains the wall of your freezer. You can stack a ton of food that way! To bake: Thaw dinner in refrigerator 8 hours (pull out in the morning). 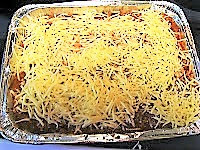 If using a freezer bag, pour contents into a baking dish making sure manicotti are in a single layer. Top with cheese. Bake covered 400 degrees for 45 -60 minutes, uncovering the pan for the last 15 minutes or so to brown the cheese a little bit! (Can bake from frozen but will need 1 1/2 hours to bake).